Posted inBasic Spanish / Learn Spanish / Spanish Videos / . . .
Shopping! The Verb To Need: Sometimes you Really Need it. 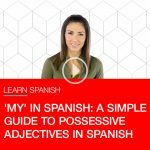 Posted inBasic Spanish / Grammar / Learn Spanish / . . .